Robin’s Winter Song is a beautifully illustrated picture book that is the perfect read for this time of year. Autumn is almost over and winter is coming. But what exactly is winter? The Story: Robin notices something is different when trees start losing their leaves, finches fly south and Squirrel is busy burying nuts. He learns that winter is coming but is frightened as he doesn’t know what winter is. He snuggles up to sleep with Bear and when he wakes up there is snow everywhere. Robin discovers that winter is fun and when the snow starts to melt he’s determined that spring, whatever it is, won’t frighten him. Robin meets different woodland animals and birds who are preparing for winter. Owl advises him to stay warm and snug and we love the way that an uncertain Robin cuddles up with Bear. We share Robin’s amazement when he sees the wintery landscape and love the double spread which shows animals playing in the snow and discovering the wonders of a snowy forest, their excitement mirrors that of a child who sees and experiences snow for the first time. Suzanne Barton’s illustrations are beautiful and she uses earthy, natural colours on predominantly creamy backgrounds. The vibrant reds and browns of autumn give way to cold, crisp wintry scenes with the animals and the tree trunks providing splashes of colour in the snow. Our favourite illustration is the final spread which shows a happy Robin singing to his friend Bear as the spring flowers peep through the snow and Squirrel discovers another of his buried nuts. 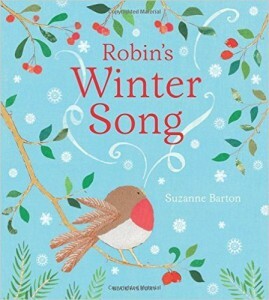 Robin’s Winter Song would be a wonderful book to use in the classroom as part of a topic on seasons. As well as portraying the different characteristics of autumn and winter it shows how animals and birds behave during the seasons and also includes the concept of hibernation – we love the way that Bear tells Robin that there’s just one sleep until winter goes away! It’s also a great story to stimulate a discussion about change and the uncertainty that children may feel when they don’t fully understand a new situation or experience. 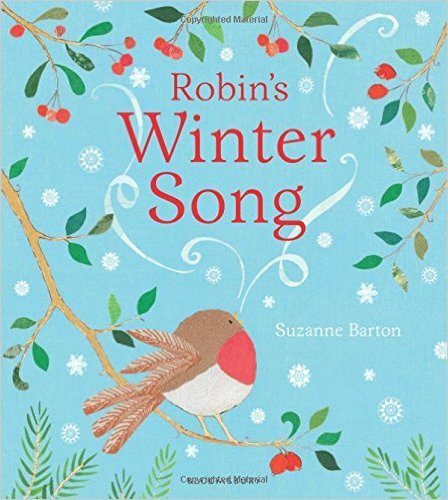 So many themes that are familiar to children are included in Robin’s Winter Song – friendship, uncertainty, the changing of the seasons, dealing with new experiences. It would make a fabulous addition to a home or school library. This sounds great! I love robins – they are so cute and seeing them begins the winter pre-Christmas excitement! #readwithme We are running a competition on our blog this week so would be lovely if you link up with us too and enter! Robins are a beautiful symbol of Christmas for me 🙂 Your competition looks great – I’ve shared it on Twitter. It’s a lovely way to explain the changes in the seasons to children. Sound like a lovely book – I will add this to my list as I’ve been collected seasonal books but haven’t got many winter ones!